A business card plays an indispensable role in doing business. It becomes your business identity that introduces you to others, helps you make clients and promote your business. And nowadays, you can even go in for online printing. However, the truth is a majority of business cards get consigned to the dustbin after just a glance, unless the product or service interests the business card recipient. The mere thought of your business card lying in a dustbin is unsettling, to say the least. Gone are the days when business cards, printed on rectangular art cards or non-tear plastic, used to elicit quick response from the receiver. Nowadays, your business card needs to be creative to grab eyeballs. 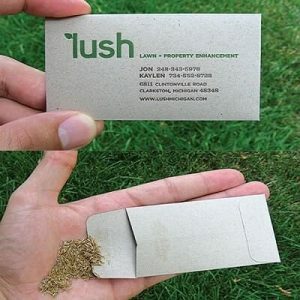 A brilliant idea is seen in this innovative business card for a lawn and property management company, selling seeds for growing grass. Instead of using the typical rectangular art card to print the matter, this business card is created in the form of an envelope containing some spread seeds with contact details on both sides. Now, how does a yoga studio attract customers? Of course, by offering them a yoga mat! However, in this case the yoga mat is the business card itself. 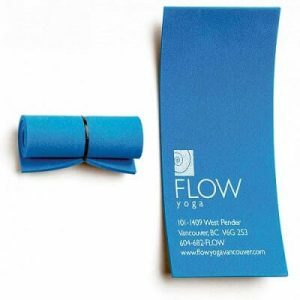 Created for a yoga studio this card uses flexible foam that can be rolled up like a yoga mat. A classic case of using material to deliver the message. 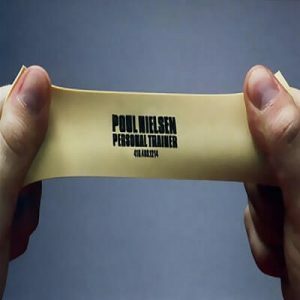 How do you convey your job as a personal trainer on a business card? Simple, make the card do what you want your clients to do – make it stretch as you would like them to do to make their bodies lithe and nimble! 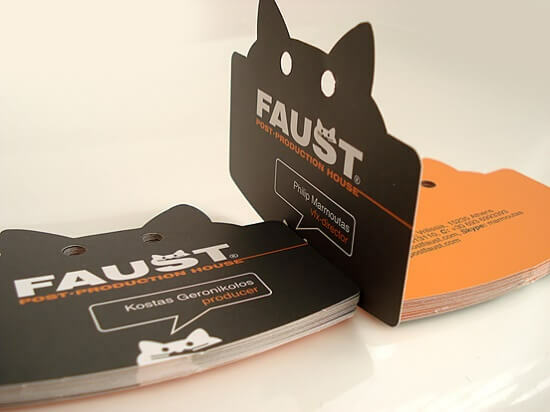 This stretchable plastic card has close-set printing of contact details that become readable only by stretching the card. 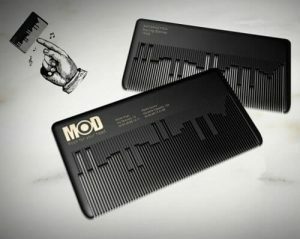 This musical comb is an innovative concept developed for a rock’n’roll hair salon. This comb, shaped like a keyboard, works like it too. You just need to run your fingernails along its teeth and it plays a classic rock theme! Anyone would like to preserve such a business card for posterity. 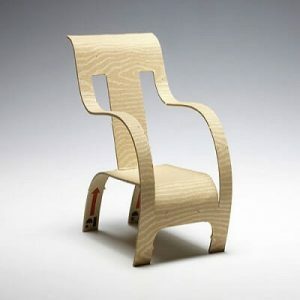 This card made out of cardboard has the blueprint of a chair imprinted on it for a cut-out. All you need to do is to follow the directions and turn this business card into a mini plywood chair of the 1934 vintage! A perfect business card to get you involved and help you remember the furniture shop. Of course, chocolate can win anyone’s heart and, in this case, make one remember the business card too. 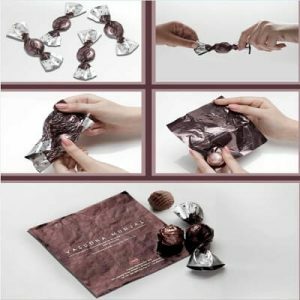 This business card is designed in the form of a candy wrapper to promote a range of chocolates. The wrapper-card includes a chocolate and a business card. 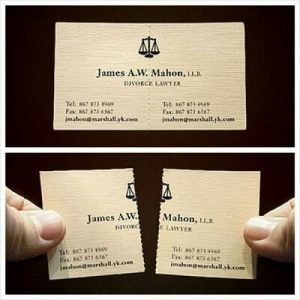 There is no better way to convey “till divorce do us apart” than this tearable business card that belongs to, who else, a divorce lawyer! The dotted line in the middle of the card is where the card can be split into two. By design, it has contact information on both the split pieces. It certainly makes a strong impression on those seeking a divorce lawyer. What do you expect a fitness trainer to do for you? Reduce your paunch, what else! Instead of saying so in words, this fitness trainer says it with his tearable business card. 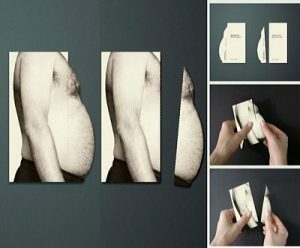 This creative and hilarious business card has dotted line along the overspilling paunch. Once cut, the body appears absolutely trim and fit. Why make people take the trouble of reading your business card if you are a butcher, why not make it in the shape of a butcher’s cleaver? 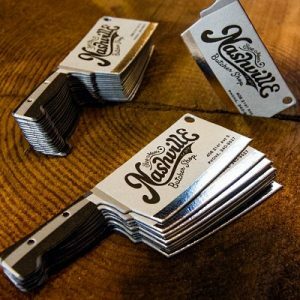 These cleaver-shaped business cards are complete with their glinting sharp edges and handles. 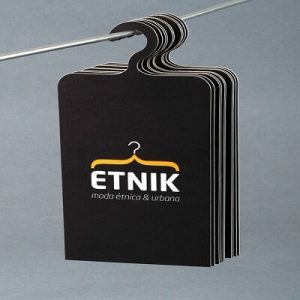 This business card is a no-brainer for the simple reason that a coat hanger-shaped card has to belong to a clothing company. The beauty of this card is you can guess from a distance who it is from. Impressed with this wide array of creative business cards? So, what are your waiting for, get creative and design one. “Get all the assistance for printing business card, brochure, posters, and more from PrintSales, a leading online printing company that services Toronto and area.